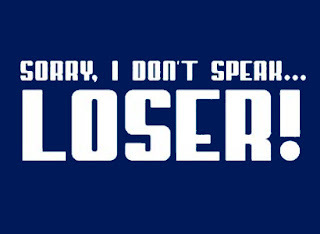 RockSports Daily Physical Education: Sorry, I don't speak loser! "I can't" is not in my vocabulary. When I say "jump", you say "how high"? Got it? Good! Now get down and give me 20! Often times when teaching it is best to get down on the students level - It is best to speak there language. Loser is not that language. Attitude is everything and this shirt will reinforce that positive attitude that is so crucial to physical education.